Often overlooked, and unknown, Belfast is a city in constant evolution. Made famous, and infamous throughout modern history from shipbuilding to one of the filming cities of Game of Thrones, there’s a lot going on and a lot to see. Belfast is the largest city and capital of Northern Ireland; it is also the second largest city on the island of Ireland. For a capital city, it is not huge by any means, with a city population of around 330,000 people and the entire Belfast urban area having a population of about 600,000. It’s a compact city, with a very rich and interesting history. Many people best associate Belfast with the ocean liner, the Titanic, which was built by the famous shipbuilders Harland and Wolff in Belfast. To this day, the large yellow cranes of the shipyard are very visible and feature in many of the city’s tours. As of recent, there’s now a visitor centre in the area, which has become known as ‘Titanic Quarter’, which is very representative of Belfast’s huge increase in tourism. Belfast remains part of the UK, but the Irish culture is very evident within the city, and creates a unique mix of British and Irish culture, from foods, accents, and even road signs often being in both the English and Irish languages. Belfast is a focus for employment from far afield in what is mostly a rural country. The traditional industries that the city was built upon – shipbuilding and textile trades – still exist and flourish here on the outskirts of the city, while the city centre is home to many large office buildings and commercial centres. 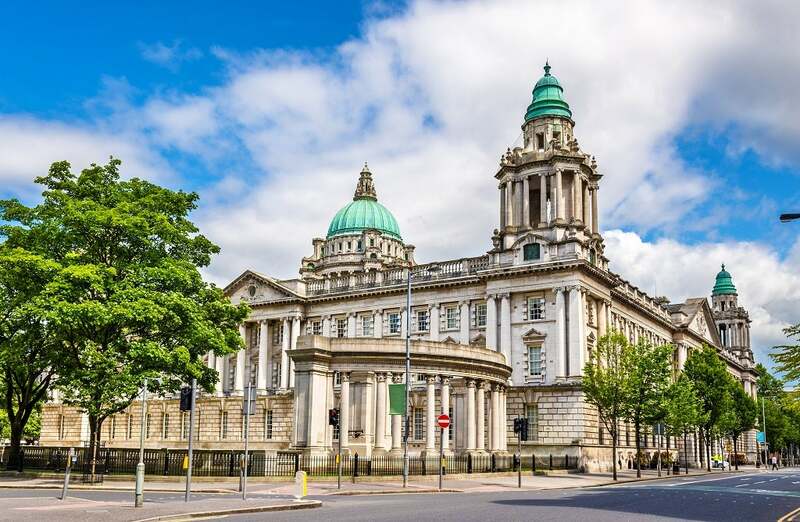 Being slightly cheaper than much of the UK, particularly cheaper than London, Belfast attracts a lot of business to the city and with it comes ever-increasing prosperity. Unemployment in Belfast has often been higher than in mainland UK cities, but this really isn’t a true reflection of the city. The overall unemployment rate in Belfast currently sits at around 8%, however, there are significant sectors with a large skills shortage, particularly for the cities large hospitals. It’s also notable to mention that opportunities exist in the growing sectors of tourism, and also within manufacturing for renewables such as wind and wave energy generation, which are prominent in the city. Belfast itself isn’t an expensive city to live in at all, and a big part of the attraction is the lower living cost compared to mainland Britain. Part of the lower cost is due to Northern Ireland maintaining the British pound as its currency, whereas the Republic of Ireland is part of the Eurozone. This does drive a steady stream of savvy shoppers from the south of Ireland towards Belfast in search of cheaper goods and services. Food on the whole remains consistent with the rest of the UK, with almost all UK major retailers and supermarkets having a presence in Belfast. Alcohol is popular here, and beer very much so. Imported beers tend to cost around £4.50 per pint, whereas local beers are cheaper at around £3 per pint. For a capital city, this is much less than London or Edinburgh and reflective of the population of Belfast. Farming is big business in Northern Island, with much of the country being rural, it’s a great place for local produce; many food markets exist in Belfast and thrive! Renting a property in Belfast is also much cheaper than in other UK capital cities, and this is a great city where finding a property is very affordable, given that you are still in the UK. Typically a 1-bedroom apartment in the city centre of Belfast will cost £560 per month and £430 per month just outside of the city centre. A 3 bedroom apartment in the city centre offers excellent value for a city centre location averaging £860 per month, and just £660 per month outside the city centre. That said, there are many new luxury developments in Belfast, which are on the waterfront and command significantly higher prices. In Belfast, as across all of Northern Ireland, a tax is paid by all properties based on the value of the property. In much of the UK, this is known as Council Tax, in Northern Ireland it is simply called ‘rates’ and is often much cheaper than mainland Britain. Rates range from about £250 per year to over £3000. Internet access, for broadband internet, cost is around the national average of £20 per month and the choice of providers is vast. Being quite a small city, getting around Belfast can often be done on foot. There are many bus services within the city that provide convenient access to residential parts of the city as well as a rail service that extends across Northern Ireland and into the Republic of Ireland. A typical bus journey within the city will cost you £1.90. Having more space than mainland Britain, many people tend to live in houses in Belfast, particularly away from the concentrated city centre itself. With house prices much lower than England, a lot of people in Belfast will own their property rather than rent. In line with much of the UK, property prices are rising and Belfast is no exception. Currently, property across Belfast is increasing in value by almost 15% per year. This is close to double the annual increase across the UK as a whole. Part of this rise is seen as a reflection of Belfast being a very desirable place to live. An average 1-bedroom apartment in Belfast city centre costs £95,000. Outside the city centre a 1-bedroom apartment costs around £70,000. 3-bedroom apartments in the city centre cost £230,000 falling to £150,000 outside the city centre. With property prices much lower than the rest of the UK, but salaries often similar, Belfast can be a very sensible place to purchase property. Being a city with a very colourful past and bright future, it can be difficult to really understand Belfast as a city. Whilst there are still areas within the city that are less desirable to live in currently, it’s important to realise that Belfast is growing, and growing quickly. As a city it is gaining a reputation as a very smart place to live. Family-Friendly: Newtownbreda is located to the south of Belfast city centre, and is one of the most family friendly neighbourhoods in Belfast. It has a large shopping centre, and all the necessities such as a doctor, dentist and optician. The area has really changed over recent years with many new houses and apartments being built, giving this area a fresh feel to it. Close by, there’s lots of green space and forests to explore, giving this neighbourhood a real sense of adventure, yet being located within only a few miles of the city centre itself. Upmarket: Castlereagh in east Belfast holds many of the most expensive properties in the city, and it’s clear to see why. With many roads hosting large detached properties and nearby golf courses, this is an area that many take tremendous pride in calling home. To the south of Castlereagh itself sit the Castlereagh Hills, which offer superb opportunity for walking and getting outdoors. Not being served by a local rail station can be seen by some as a disadvantage, however, the lack of artificial noise is welcomed by many! Hip & Trendy: Belfast’s Queen’s Quarter is named after the nearby university Queen’s University Belfast, and is largely populated by students. However, it’s not all students and is a very lively part of the city. Within easy walking distance of the city centre and the huge botanical gardens, this area is great fun. Lining the many streets that make up the district are quirky cafes and bars, as well as superb restaurants offering many different cuisines. Beware though, it can be very lively, with a large student population. Up & Coming: The Titanic Quarter and waterfront of Belfast is very much an up and coming part of the city. Old really does meet new here, with fantastic cityscapes in the background to the Belfast loch, property here is predominantly flats with a fun vibe to them. Being located in one of the primary areas for Belfast’s tourism and very close to the city airport, the Titanic Quarter is attracting a lot of new shops, as well as bars and restaurants to cater for the needs of tourists and residents alike. Schools in Belfast do still tend to diverge with respect to the history of Northern Ireland with those further east in the focusing a lot more on British history, whereas those in the west focusing more on Irish history. Languages are also an integral part of education in Belfast, with schools having a largely Catholic population teaching Irish language. Belfast is a city where education is prominent. There are two universities in the city, Queen’s University Belfast, and Ulster University. Queen’s University is ranked particularly highly and is very well respected throughout the UK, attracting students globally also. Across the city there are 184 schools, comprising of primary, secondary and grammar schools, with generally very good levels of achievement and results. Belfast is a unique city with an incredibly turbulent and vibrant history that has really shaped it like no other. Like London, it is a powerhouse of a city, yet far smaller and with a more relaxed feel. The cultural mix of Belfast is quite unique, with a mixture of British and Irish at its heart and now, more recently an influx of migration from those further afield. The shipbuilding industries have evolved towards more sustainable motives such as the building of wind turbines and the city has developed, like many, a large commercial presence for professional services. A city once less tolerant of foreigners has transformed completely into a city that welcomes foreign citizens and has a booming tourism economy to back it up. There never has been a greater time to consider Belfast as a destination. From the towering cranes of the shipyard, to the Titanic museum, there’s masses to see in Belfast. From heavy industry of years now long gone, there’s a modern bustling city centre enveloped in huge old buildings, which each have a story to tell. Culture in the city is also definitely on the to do list and whilst there are many theatres and museums to visit, simply walking around the city is a cultural experience in itself. Everywhere you walk, you’ll hear different accents and languages, reflecting how diverse this city really is. The Northern Irish government has its parliament buildings at Stormont and it’s possible to visit this incredible building and its gorgeous surrounding parks for a true sense of history itself.